Domaine de la Biscarelle is a young estate, especially when you look at several properties in the Southern Rhone Valley. Founded in 1984 by Gerard Bouyer in 1984, the domaine took its name from its geographical location. The property is located in Les Grein Orange. Until 2008, the harvest was sold to negociants, making 2009 the debut vintage for the property. Today, Domaine de la Biscarelle is managed by the daughter of Gerard Bouyer and her husband, Jerome Grieco. The vineyards of Domaine de la Biscarelle are located in the middle of the communes of Cabrieres and Maucoil. The terroir is red clay, sand, small pebbles and rocky soils. The vines are mostly Grenache. But they also have plantings of Cinsault, Mourvedre, Syrah, Counoise and Terret Noir. 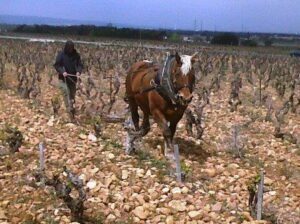 The vines are planted in the Cabrieres and Palestor lieux-dits. While much of the production is placed into the wine of Domaine de la Biscarelle, a portion of the harvest is still sold to negociants, most notably, Louis Bernard. Domaine de la Biscarelle produces two red Chateauneuf du Pape wines and they also produce wine from 17 hectares of vines they own that are planted in the Cotes du Rhone appellation. Domaine de la Biscarelle is produced from a blend of 90% Grenache and assorted other varietals Cinsault, Mourvedre, Syrah, and Terret Noir. The Grenache vines are old. Some of their Grenache vines are more than 100 years of age. The grapes are not usually destemmed. The wine is vinified in traditional cement vats and aged in cement tanks for 12 months. The production is on average, 1,500 cases per year. Domaine de la Biscarelle Les Anglaises is produced from mostly old vine Grenache and 3% Mourvedre. The oldest vines were planted in 1904. The grapes are generally whole cluster fermented. The wine is vinified in traditional cement vats and aged in used, French oak barrels and cement tanks for 12 months. Domaine de la Biscarelle is also one of the few vineyards to produces a wine from 100% Cinsault. Domaine de la Biscarelle can be enjoyed on the young side. Young vintages can be popped and poured, or decanted for about 1 hour, give or take. This allows the wine to soften and open its perfume. Older vintages might need very little decanting, just enough to remove the sediment. Domaine de la Biscarelle is usually better with 2-3 years of bottle age. Of course that can vary slightly, depending on the vintage. In the best vintages the wine should be consumed within 4-12 years after the vintage. Domaine de la Biscarelle is best served at 15.5 degrees Celsius, 60 degrees Fahrenheit. The cool, almost cellar temperature gives the wine more freshness and lift. Domaine de la Biscarelle Rouge is best served with all types of classic meat dishes, veal, pork, beef, lamb, duck, game, roast chicken, roasted, braised and grilled dishes. Domaine de la Biscarelle is also good with Asian dishes, hearty fish courses like tuna, mushrooms and pasta. Medium bodied, and already approachable, with a peppery kirsch, black raspberry, thyme, Provencal herb and spicy profile. Medium bodied, light, forward, fresh, easy to like wine, with sweet, soft, strawberries, kirsch and raspberry notes on the nose and palate from the start to the finish. Spicy red fruits, with a peppery core, this forward styled zippy, wine will drink best young. Spicy, jammy, black raspberries, the soft, sweet, ripe and spicy tones really shine all the way through. Medium/full bodied, young, but approachable, this elegantly styled wine offers loads of fresh, sweet kirsch, thyme and ripe black raspberries in a smooth, user friendly style. This is just starting to show nicely and made a perfect pairing with rare, grilled burgers topped with melted Gruyere.